3 Bdrm Top flr Flat. Hall. Lounge. Dining kitch. 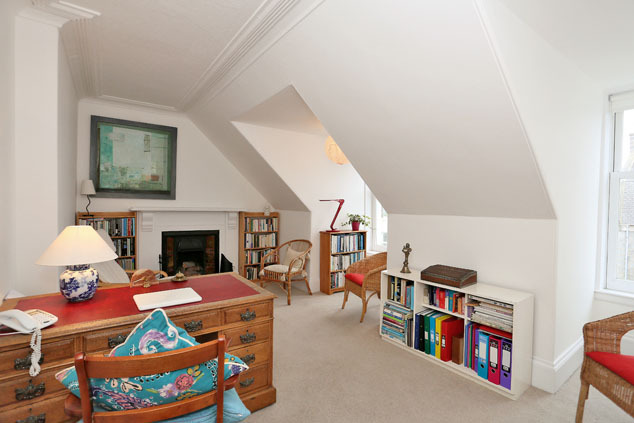 Study/Bdrm. 2 Bdrms. Shower rm. Attic rm (CT Band - D). Garden. Parking. 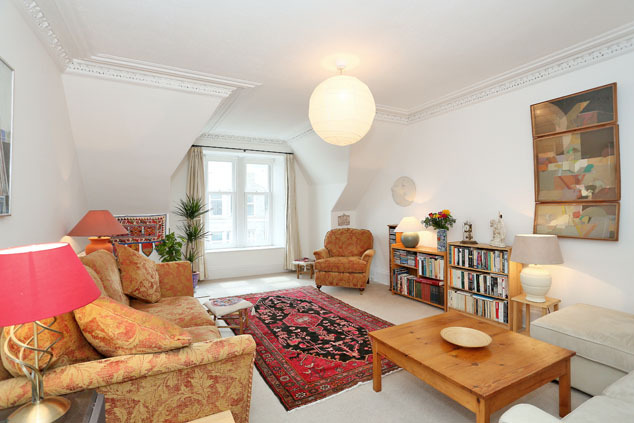 Fixed price £275,000 Entry by arr. Viewing 07823 407202 or contact solicitors. Below Home Report Valuation (EPC band - E). 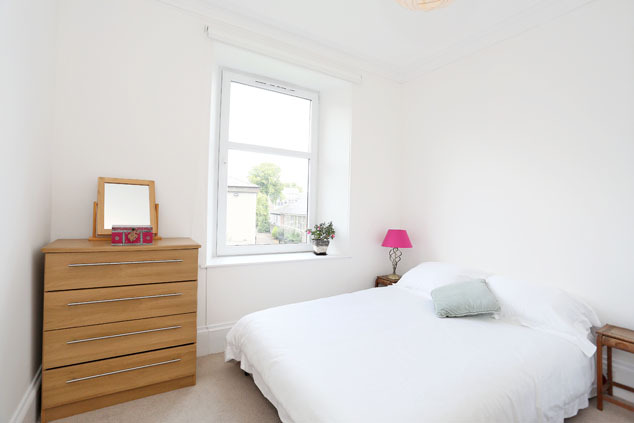 Situated in the ever popular West End of the city, within walking distance of an excellent range of amenities including shops, restaurants and recreational activities as well as public transport links across the city and beyond, we are delighted to offer for sale this versatile three bedroomed upper flat which also boasts an additional attic room. 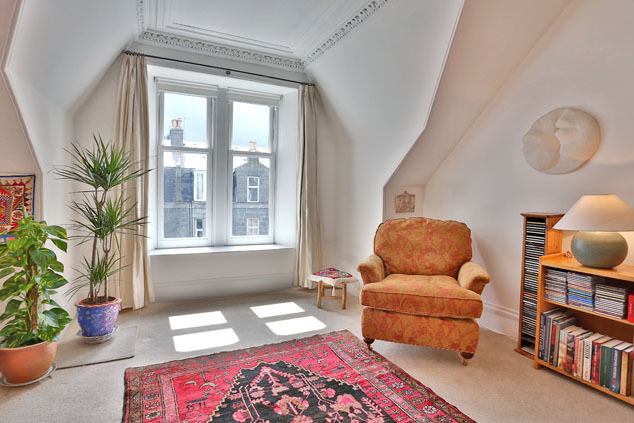 This appealing property offers a somewhat unique level of accommodation where original charm has been retained alongside fresh neutral décor and warm carpeting. 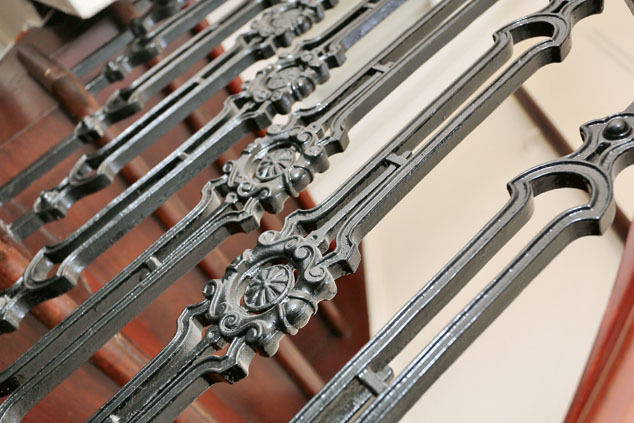 The accommodation comprises a welcoming entrance hall which leads onto the impressive lounge showcasing some beautiful traditional features and continues through to the well appointed dining kitchen. 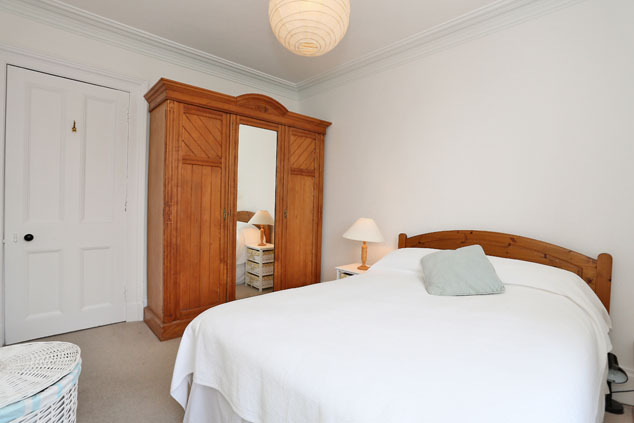 Overlooking the front of the flat is a versatile bedroom with original fireplace and to the rear there are two well proportioned double bedrooms and a modern shower room. 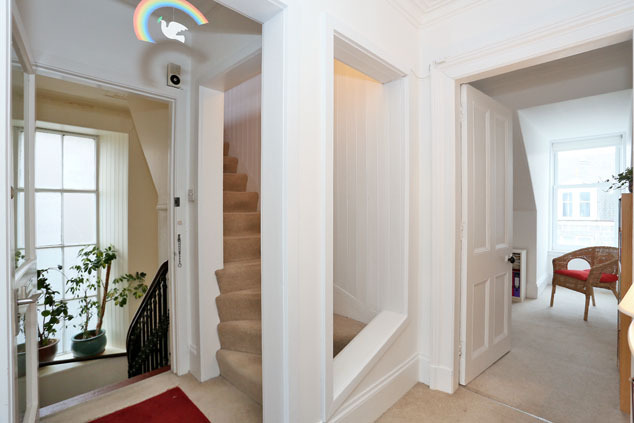 Completing this home is a large attic room which is undoubtedly an enviable bonus and is accessed via a fitted staircase. 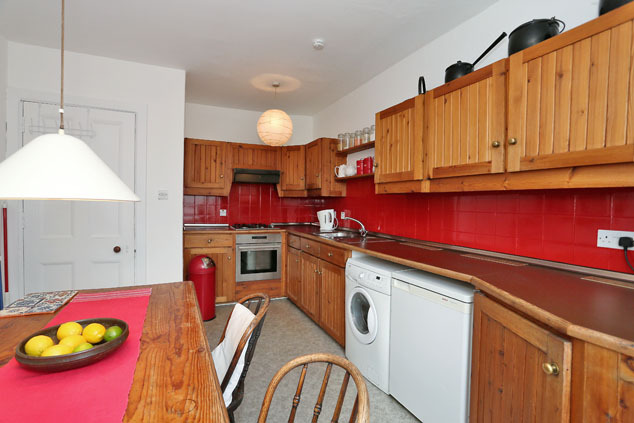 Outside, a large shared garden has drying facilities and the flat has the luxury of secure off-street parking accessed off Albyn Lane. This is truly a rare opportunity to purchase a wonderfully versatile and attractive home in an excellent location, therefore early viewing is genuinely recommended. Union Grove is an attractive street in the heart of the city with a wealth of amenities including a local newsagents and chemist within striking distance. 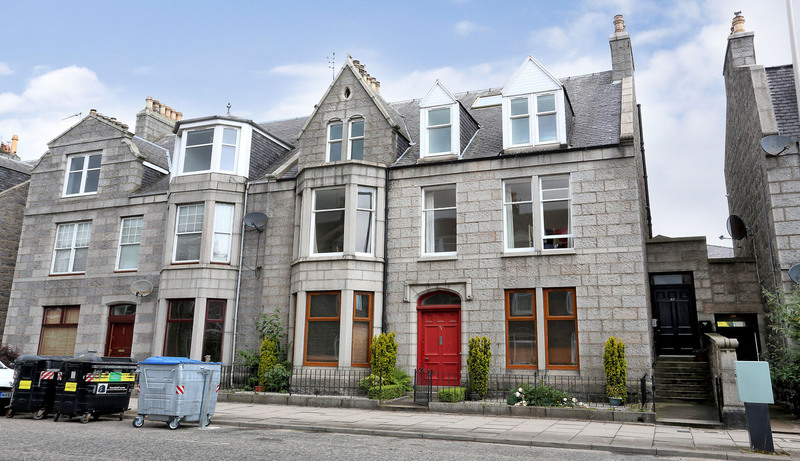 The city centre with its wealth of amenities and recreational facilities is only some 5 minutes walk from the property and the subjects enjoy easy access to Anderson Drive, therefore to the business centres to the north and south of the city, the hospital complex at Foresterhill and Aberdeen Airport. The Robert Gordon Campus at Garthdee is also within easy travelling distance. Regular public transport to many parts of the city is readily available. 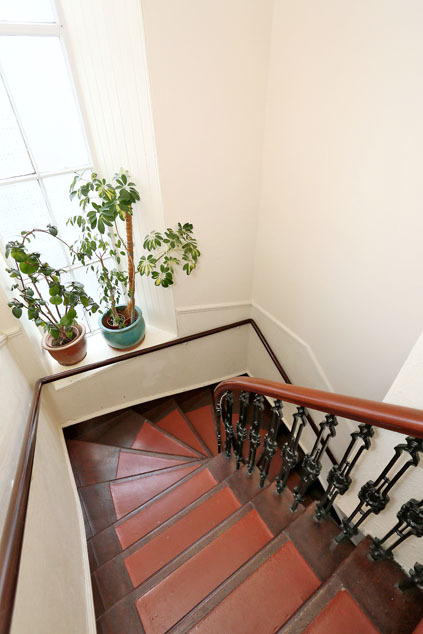 Communal Hall Entered via a security entry door to the side of the building, the communal staircase serves only two properties and is in excellent condition. A door provides access to the rear garden. Entrance Hall Entered via a timber panelled door, the hallway is afforded natural light from the large glazed panels. Fresh, neutral décor enhances the welcoming atmosphere and warm carpeting continues throughout the majority of the accommodation. 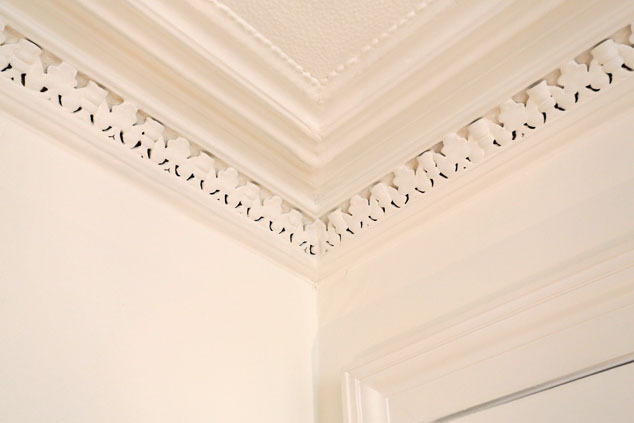 Traditional panelled doors and decorative cornicing are lovely features and storage is provided by a cupboard with shelf and coat hooks. A high level unit conceals the fuse box and electric meter. Lounge 20’9” x 13’5” [6.35m x 4.11m] approx. With a modern sash and case window framing a view over the front of the property and bathing the room with lots of natural light, this wonderfully impressive lounge is of excellent proportions with intricate period detailing including ornate cornicing and extra height skirtings which sit comfortably alongside the simply stylish décor. 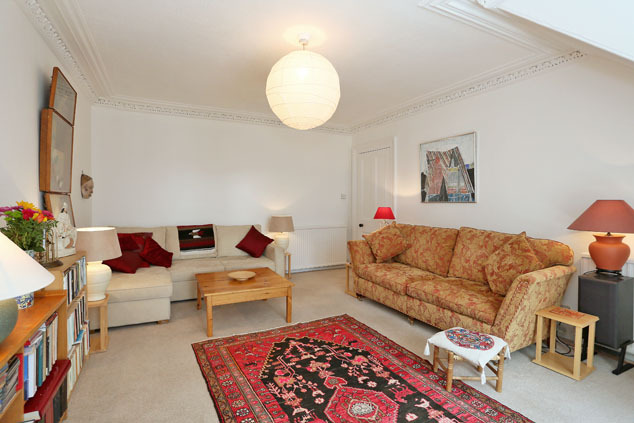 There is plenty of floor space in this large room for soft furnishings. TV point. Dining Kitchen 15’0” x 10’8” [4.59m x 3.27m] approx. With superb dimensions and traditional style, this well appointed kitchen has ample space for a large dining table making it a fantastic space for both everyday dining and entertaining. 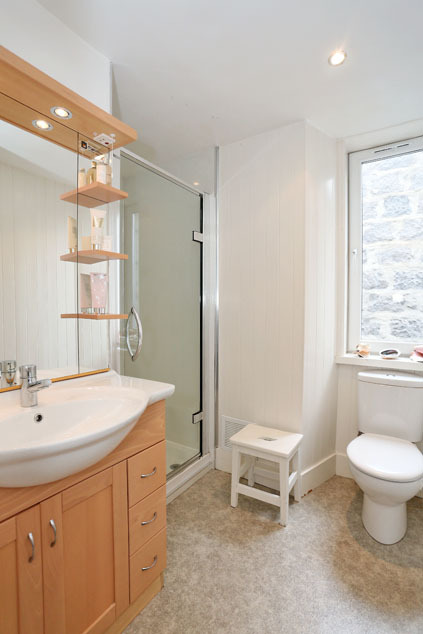 It is fitted with an excellent range of solid wood base and wall units edged with splashback tiling and topped with co-ordinating work surface which incorporates a 1.5 stainless steel sink with mixer tap and drainer. 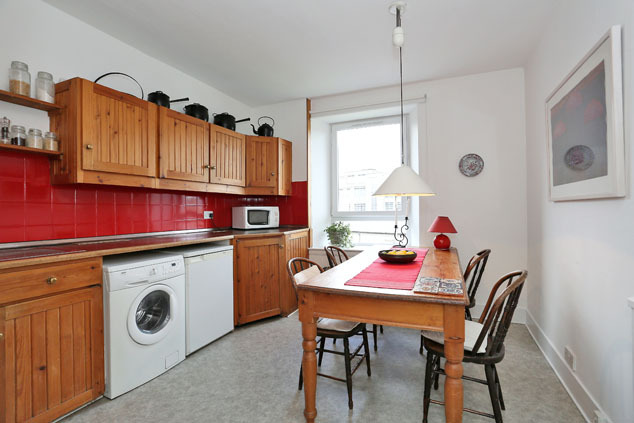 The integrated appliances include a gas hob with extractor above and oven with grill function, the free standing fridge and washing machine will also be included in the sale. Telephone point. Study/Bedroom 1 16’11” x 9’11” [5.16m x 3.03m] approx. This versatile space is flooded with light by two large windows which overlook the front of the property. 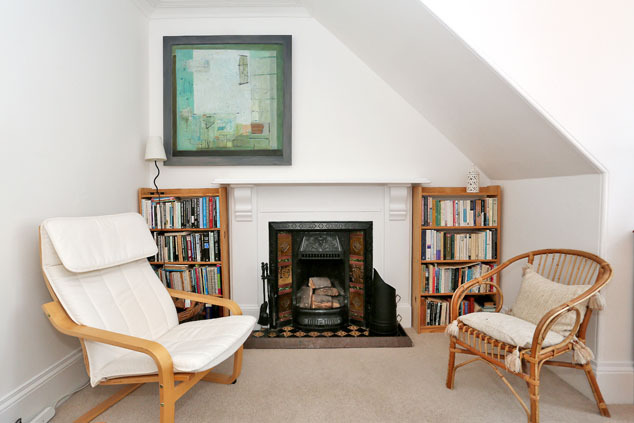 The good dimensions would allow for a double bed as well as any other required furniture but with its period detailing including a traditional open fireplace with cast iron insert and decorative tiled hearth as well as original cornicing, this is also a lovely public room. Telephone point. Bedroom 2 12’8” x 9’6” [3.88m x 2.92m] approx. 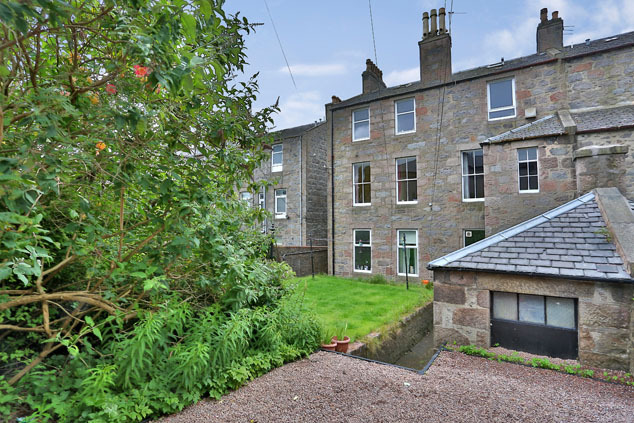 Enjoying a peaceful location overlooking the rear garden is this wonderfully bright double bedroom with complementing neutral tones and original cornicing. Boasting excellent dimensions, there is space for items of required free standing furniture. Bedroom 3 11’9” x 9’8” [3.60m x 2.97m] approx. 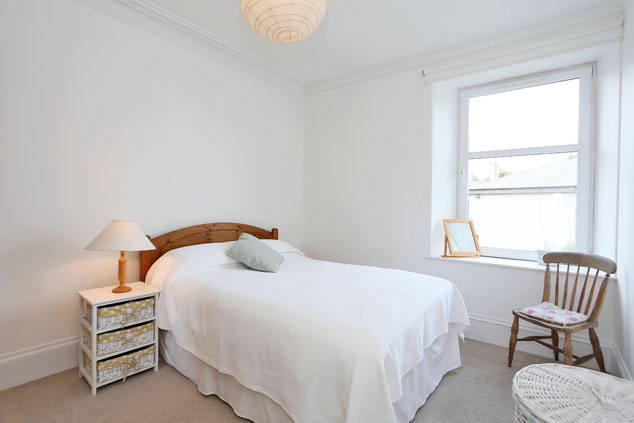 To the rear is this good sized double room which has crisp white tones complemented by an abundance of light. The good dimensions allow space for free standing furniture. Shower Room 8’0” x 6’9” [2.46m x 2.08m] approx. 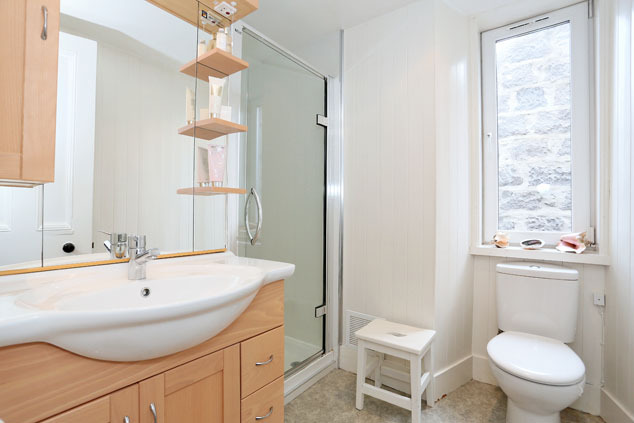 With a window to the side for natural light, this modern shower room comprises a w.c., sunken wash hand basin set within a wood effect storage and vanity unit with display shelving, drawer storage and large mirror with downlighters. Completing the suite is a recessed shower with electric Mira unit and glass door. Attic Room 29’7” x 13’5” [9.03m x 4.11m] approx. 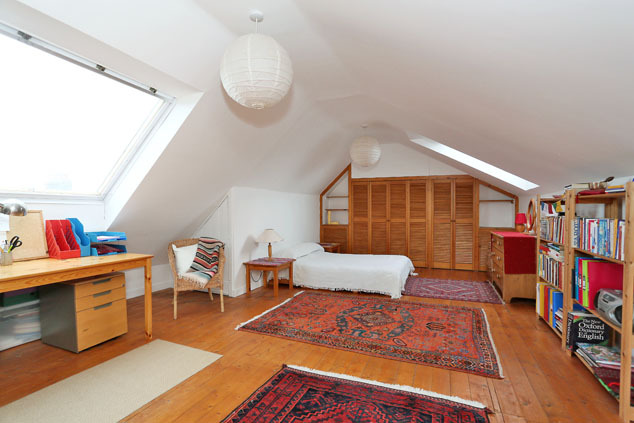 A carpeted staircase leads up to this wonderfully versatile attic room which is flooded with light by numerous velux windows. The décor is in simple neutral tones with hardwood flooring which add to the bright and airy atmosphere. 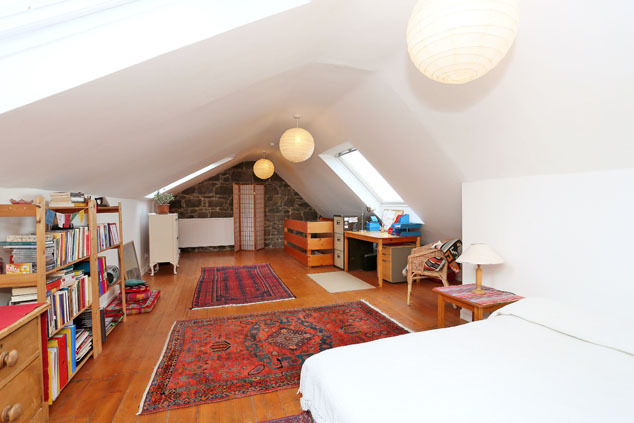 Currently utilised as a hobby room and occasional bedroom, the attic space has excellent built-in storage as well as access to eaves storage where the water tank is also located. Telephone point. 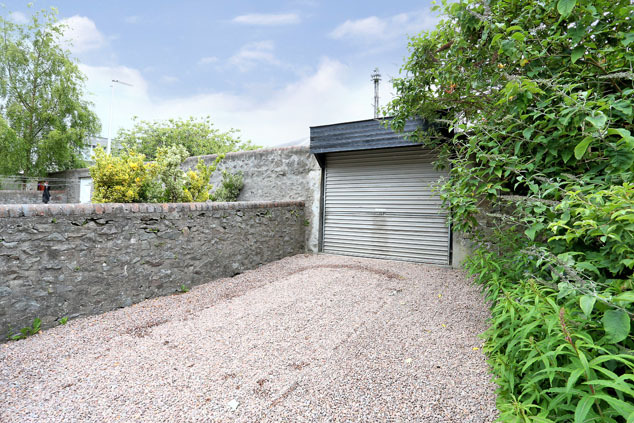 Outside This appealing flat enjoys the luxury of off-street parking accessed off Albyn Lane and secured with a roller door. The mature garden has a large area of shared drying green and there is pedestrian access to the rear lane. A wash house is shared between the proprietors of the building and there is an exclusive outside store. Notes Gas central heating. Double glazing. EPC=E. The subjects will be sold inclusive of all fitted floor coverings, light fittings, curtains and blinds along with all integrated appliances and free standing white goods.